“As a team of licensed Master estheticians and creative professionals, we offer cutting edge services that produce visible changes to the skin. Whether you are concerned with acne or aging, we will help you achieve your goals with the skin. Our approach treats acne without antibiotics and harsh prescription topicals. Instead, we use professional-grade skin care to control acne. Your skin will not only be clear, it will look smooth, healthy and radiant as never before. The modality we utilize is based on the research, teaching, and practice of Dr. James Fulton Jr., M.D., and Ph. D., the most renowned acne experts in the world. We are known for our successful acne treatments as well as our post acne scar reduction treatments. This client had just started up and had no website or authority online, so they were generating absolutely no traffic or leads through Google and other search engines. Xillionaire supported them by creating fast results from very little by targeting keywords that weren’t over-saturated and impossible to rank for at the beginning stages. Instead we went from high demand, and low to medium competition keywords that were very targeted to the clients they were looking for. 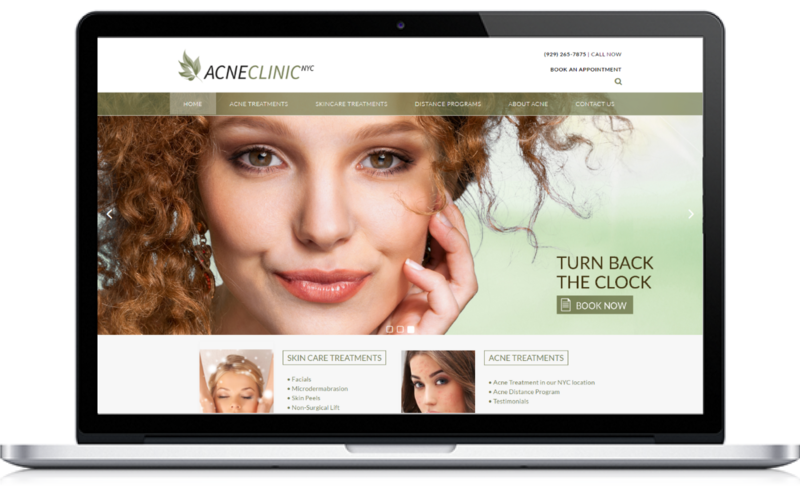 Page 1 rankings for Local SEO keywords in the NYC area: acne clinic nyc, acne clinic, dermaplaning nyc, vi peel nyc, acne ingredients checker, acne skin clinic, acne treatment nyc, acne specialist nyc, and much more!